It's been six days now with Logray no showing to the party.. I check all the rooms 4 times a day.. Sometimes I even refresh my look... He never was like this. Becoming such an antisocial bear to is no where to be seen or maybe his new girlfriend CG is putting her foot down, who knows..
Day 18, no Logray, sitting at 95/100. Started using crystals to do 2 guild store refreshes a day the last 3 days, no luck. Logray is getting farmed quicker than Wicket for me. Both at 6*... I won't get them high enough gear to 7* c3p0 anyway, so here's hoping to 6* him this time and 7* next go around. I'm 96/100 and Logray continue to not appears in the shop but Dengar is the new "young solo"
Logray shows up in regular Shipments pretty often in a 4 for 320 pack. Sounds like just what you need. Look on the left, 4th row down. It's always an ewok IIRC, and Logray does show up in that spot (though I think it's also a 1 in 6 chance because I think all the ewoks except Wicket show up there). Before 3PO event advertised: Logray is seen often, perhaps once a day, maybe every other day. Never needed to refresh. After event advertised: Despite 3 refreshes per day, and checking every normal reset, absolutely zero Logray. It's almost like it's on purpose, huh? I thought, 4 days, 26 shards needed, I can do this with spending some crystals. Nope. So frustrating. I quit spending real money long ago, do they want me to quit totally? Also I spent 4hours straight attempting c3po and was nowhere near completing tier 7 until I finally got logray to 7* (I was only 5 away). 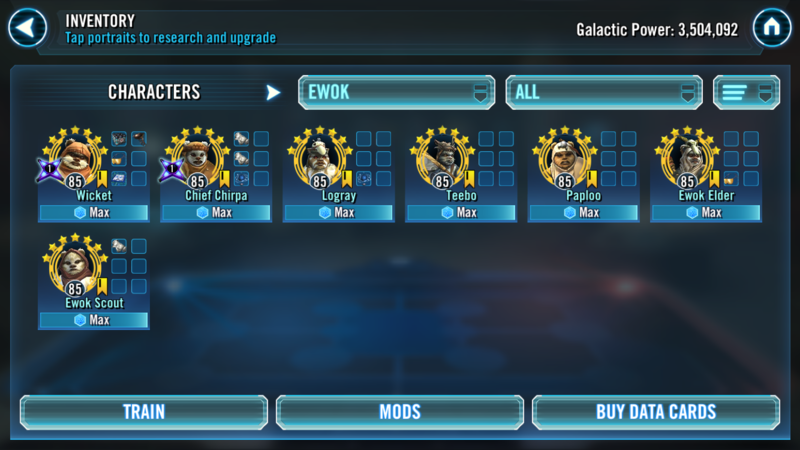 I had wicket and elder at g12, chirpa at g10, paploo at g11 and teebo at g8 AND had my arena mods on them. Once g10 logray replaced teebo it was easy. I think the problem is the apparent "drying up" of needed shards before and after the announcement of the event. The event was announced and I went into refresh mode after saving 5K tokens. So: 3 normal refreshes (6am, 11am,5pm for me) per day. Plus 4 crystal refreshes (50,50,100,100) per day. 7 chances per day for 5 days. 35 chances with 0 Logray appearances, when he was showing up once every day or every other day (without refreshes). Seems fishy, and frustrating to say the least. Only need 26 more, so 6 purchases. Weak. Day 19, 95/100 and no Logray, can 6* the event with mod swaps. We’ll see if he’ll come out of hiding, tried 2 guild store refreshes, and he’s still a no show. My favorite part of this thread is when people complain how Logray hasn’t shown up for X days, but when he finally does they have no guild tokens. It's 4 refreshes per day for every store except Fleet: 0600, 1200, 1800 and 2400 local time by default. Oh no, not the old "You should have farmed XYZ long ago" attack. How ever will I survive? Can't farm everyone at the same time. If I saw him, I bought him. If he wasn't there, I couldn't. Had no bearing on how long he was available, or if he was a priority or not (which he was). Had him in store 2 times in the last 2 months and I have usually done the two 50 crystal refreshes daily. Pretty ridiculous, I've geared scout to G11 to replace him but it is gonna be a lot harder without him + all the extra gear wasted because Scout will never be used outside of this event again. In the same time frame as I got my Wicket from 3* to 7*, I got a total of 30 Logray shards..
Of course I didn't prioritize Ewoks, well, because they're *Ewoks* ffs. Once they became needed I farmed hard the ones I wasn't a slave to RNG for. I cannot control that. What I could do, was multiple refreshes. I just found it highly odd, that RNG was favorable before the announcement of the 3PO event, and highly unfavorable once it was. So because this, my zLogray sits at 6* G11 until RNG goes my way. Buy Logray from Weekly shipments. I also did the event with G10 Chirpa, G11 Paploo/Wicket/Teebo, G12 EE. My Logray isn't even 6 star, I buy his shard still once or twice a week, but for C3P0 he is far less required than the Zeta on Chirpa, EE, Paploo and Wicket. You could sub him in the 5th spot, but Teebo gives TM & Stealth to your team as well as removing buffs and TM, he a much better option for this event IMO as well as being easily farmable. Started at 4* logray since 3p0 ended. He's at 75/100 now. No worries tho, got 7* 3p0 with g12 ee, g11 wicket, g9 paploo chirpa, g8 teebo. Mods ftw!